When my kids were small, they enjoyed playing with rubber stamps. Of course, I sat at the kitchen table and stamped right along with them. I especially enjoyed our set of alphabet stamps, using them to put together words in irregular, interesting ways. 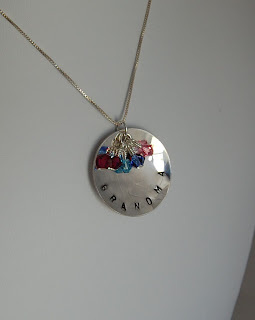 So when I discovered that similar stamp sets existed for putting letters on metal to create jewelry, I had to give it a try. I signed up for a class at my local bead shop; this was the first piece I ever created. 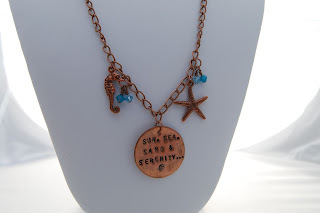 Metal stamped jewelry is pretty labor-intensive. Each letter is placed individually using a metal stamp and a mallet; patina is added to make the letters “pop” and the excess removed with a buffing cloth. Giving the piece a domed shape is also possible; I did this with the “GRANDMA” and “AUNT” pendants I made for my mom and my sister-in-law at Christmas time, similar to this one I recently made for myself. Finally, I felt that I was ready to hit the big time and work with sterling silver. The prospect was a little daunting; metal stamping is completely unforgiving. One false move and your piece is ruined, and whereas a one-inch copper disc sells for 70 cents, a one-inch sterling silver disc costs ten times that much. Each grandchild is represented by a crystal birthstone. 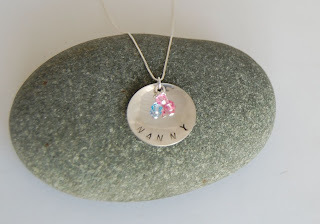 and a “NANNY” pendant who special ordered it to give to her own mom on Sunday. The silver pieces were hard to photograph because they are so very reflective. 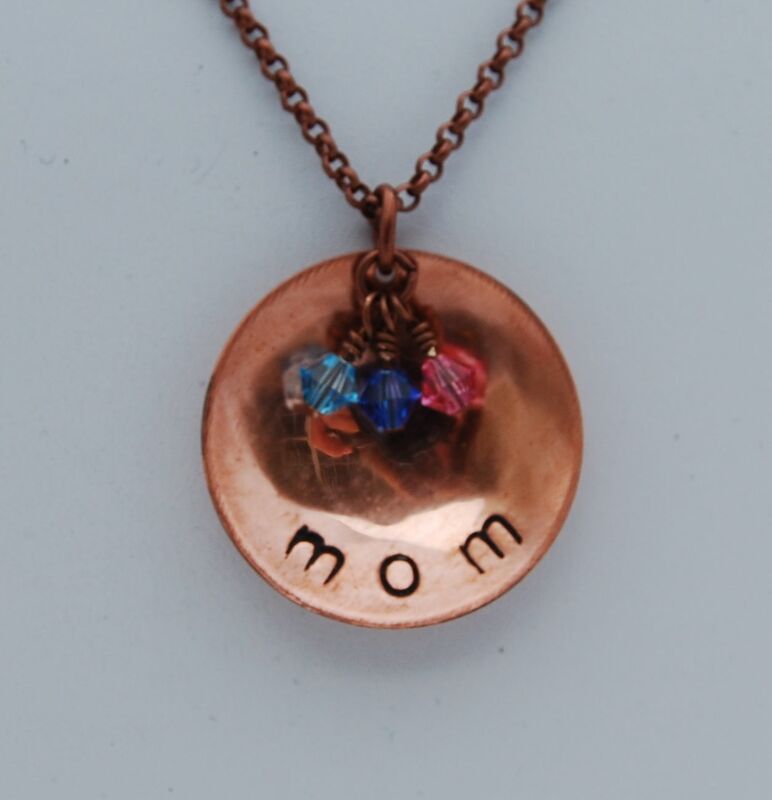 But this pendant is shaped exactly like the “GRANDMA” pendant. 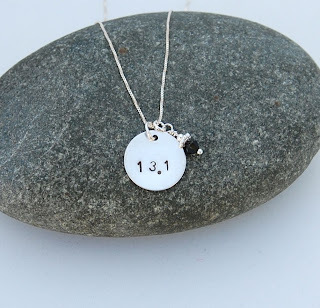 Then I made a pendant for a friend’s birthday to celebrate her accomplishment running her first half marathon this spring; she said it was one of her favorite birthday gifts of all time. That made me feel like a million bucks. Here’s a picture of the one I made for myself. I chose a black crystal because I wear a lot of back. Other options are pearls and crystal birthstones. I am hooked. I am saving my pennies for a set of alphabet stamps in a fancy font; I have tons of ideas for future projects. To quote Louisa May Alcott, I like good strong words that mean something. And now I can use them to make jewelry that means something.